Overhead cranes are a highly flexible mechanical handling system, giving you total access to all parts of the factory or warehouse while leaving the floor completely uncluttered. They are an investment that lasts - many users will expect a crane to have a working life of 20 years or more. 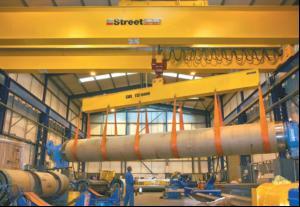 Process requirements Not all overhead cranes are the same. There are 'standard' cranes, but very few standard applications. Overhead cranes should be customised for demands placed on them and considered as an integral part of the manufacturing process if they are to be effective at the outset and reliable in the long run. Look carefully at the manufacturing process and factory throughput - both now and into the future. This will help in assessing the speeds required in long travel, cross travel and hoisting. Consider also the maximum number of daily crane movements and proportion of lifts and transfers at the upper end of the crane's safe working load (SWL). This analysis enables the crane maker to ensure the mechanisms in the crane are appropriately rated. An over rated crane will cost more at the outset, but an under rated crane may prove troublesome and costly, both in repairs and in the cost of outages. Safety considerations The safe working load is declared in bold numbers on the main crane beam. Even though cranes are engineered with a margin of safety, it is important not to exceed this. Capacity restrictors (overload cut out devices) are mandatory in EU countries. Another aspect of crane safety is load stability. Is the load small and compact or large and cumbersome? Small compact loads can be easily handled by a single hoist, but it may be worthwhile with more cumbersome loads to consider twin hoist lifting for additional stability. Crane speed is another factor in load stability. If a crane with load accelerates rapidly the load will initially trail, but if the crane is then stopped, the load may swing dangerously. In both cases this could lead to slippage and dynamic loads are placed on the crane structure that could be damaging. These effects can be largely eliminated by the use of appropriate control technology to control acceleration and deceleration such that drag and over swing are virtually eliminated. Correct choice of handling equipment is crucial. Special equipment is available for the safe handling of steel plate, glass, metal coils and other difficult to handle products. There are also a whole range of safety accessories that can be installed. Strobing lights and audible alarms are useful on Goliath cranes to warn of the crane's approach. Floodlights are useful on yard cranes and in sparsely lit plants and warehouses. Collision prevention systems are useful where two or more cranes share the same track. Practical considerations There are often practical constraints.Many modern industrial buildings are only lightly built. This may preclude the installation of heavy traditional cranes requiring a track to be built into the portal frame but a free standing internal gantry can be installed within the factory supported on its own foundations. New designs of single girder cranes, portal cranes (Goliath cranes) or semiportal cranes are also available. The practical limit for a single girder (mono-rail) crane was for many years about 15t. New designs of hoists and beams have extended this widow and for many applications mono-rail designs are available up to 25t SWL. Other concerns may stem from the factory environment. High ambient temperature, the presence of dust or aggressive chemicals may present potential problems. In all cases there is a solution. This may involve the resizing of motors to prevent overheating, introduction of artificial cooling for control cabinets, filtration to remove dust or the use of corrosion resistant finishes. Maintenance Modern cranes are designed to provide long term service with reliability. However, all mechanical devices require periodic servicing. This can be more rationally planned where hours-of-use meters are in use to indicate the optimum time for preventative maintenance. We recommend that maintenance is conducted on a planned basis by a reputable company.